Since the Kilauea volcano first erupted in Leilani Estates in Hawaii on May the 3rd, it has spread more than four billion cubic feet of lava on Hawaii’s biggest island. That’s roughly 30 billion gallons of lava that have made new land and forever changed the shape of the island. The eruption is in a historically active volcanic area, known as the Lower East Rift Zone, where the landscape has been built and shaped by hundreds of centuries of lava flow. New ground formed by eruptions in the 1950s and 1960s is still visibly barren. 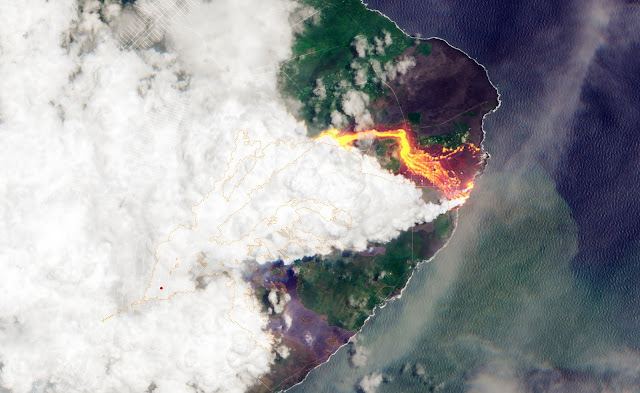 The massive lava flow from Fissure 8 was spotted entering the ocean beyond what was once Kapoho Bay by a satellite on June 7. A plume of vry toxic volcanic lava haze, called laze, stretched for the miles. The time lapse image below shows how lava consumed trees, buildings and part of a geothermal power plant over a week at the end of May. 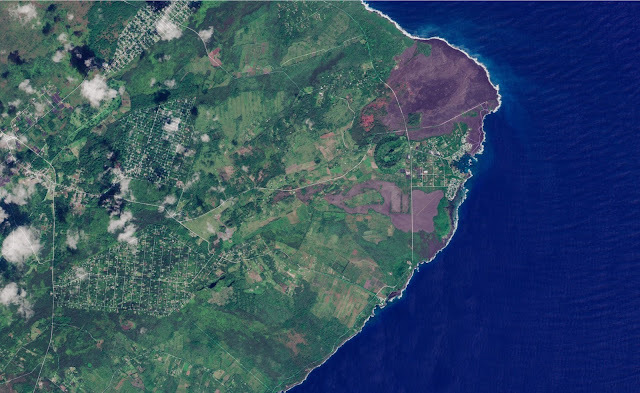 The current eruption burst through the ground more than a month ago in the Leilani Estates neighborhood, where fissures ripped open and lava destroyed homes and wiped out several square miles of buildings and property. More than 20 fissures are linked to this eruption, but Fissure 8 has been the most active and destructive, spewing a fountain of lava more than 200 feet in the air and feeding the flow that continues to create new land for six miles, east of the Vacationland neighborhood and the now lava-filled Kapoho Bay.